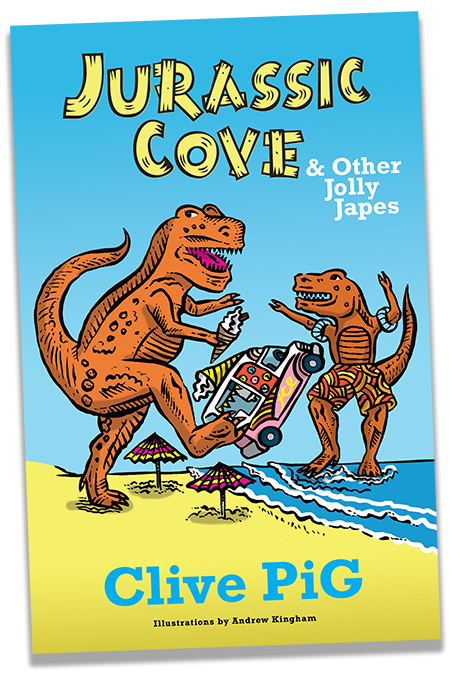 Jurassic Cove & Other Jolly Japes is Clive’s second collection of stories, poems and wordy whatsamajigs. In this action packed book full of fantastic illustrations you’ll find your imagination leaping into life. Meet Oscar and George, the two bestest of friends in Jurassic Cove who become dinosaurs for the day after drinking a Sea Hag’s magic potion. Find out how long Clarissa’s goldfish lasts after her brother swallows it in Anton Often Wondered. Read Clive’s poem The Cat PM at Number 10 specially created for Larry the Downing Street cat which Clive (not Larry) performed at No 10. Watch and listen to the Solitary Snowdrop. Jurassic Cove & Other Jolly Japes appeals to 5 -11 year olds and some who are even younger and many who are older.